AAA Dental NY (New York) - Book Appointment Online! AAA Dental is a family owned business. Founded in 1993 by Drs. 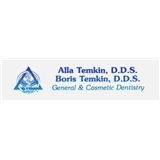 Boris & Alla Temkin, AAA Dental has strived to give their patients the best possible service and care. Both the Queens & Manhattan offices have state of the art technology which the doctors use to treat their patients. We strive to give our patients the best service we can. Click to schedule an appointment today! I went to see Dr Boris for follow up visit after my regular cleaning, and was in and out in under 30 minutes. Very professional, knows what he is doing, and plays good music in the office. I've been seeing him for 2 years and it's always been a pleasure.